Both the students and I are responsible for tracking scores. Here’s how it works. Each assessment has its own sheet in the gradebook file. One column for each standard on the assessment, in order of appearance (question order). This makes transferring scores from quiz paper to gradebook much easier. Even easier if the quiz papers are alphabetized. Cells have color-coded formatting rules. I can easily see that everyone rocked standard BF.1, while CV.4 will need reteaching. Student A did well on the whole, while Student Y should come for extra help. Once the scores for the assessment are recorded, I copy/paste them to the master sheet. The master sheet keeps track of the most recent scores for all of the standards. The columns from the most recent assessment (in this case BF Quiz 2), are copied from the assessment sheet and pasted to the master sheet, one-by-one. Most recent scores replace old scores. The master sheet allows me to see at a glance where everyone currently stands. (You cannot do this with the SnapGrades online gradebook.) I can see the date and assessment name for when each standard was last scored. And since each assessment has its own sheet, I do not lose the prior scores for the standards. The scores for students who reassess on their own time are entered directly into the master sheet and are annotated. Each student has a 2- pocket folder with prongs. The prongs hold hole-punched pages. The first page explains my SBG grading policy. The subsequent pages in the folder are tracking sheets for the learning goals. When students get a quiz back, they record the name of the assessment, the date, and their scores on the corresponding standards on the tracking sheets. Students can store the quizzes in the pockets, if they wish. With their folder, students can easily see, at-a-glance, their progress on each standard over time. According to Marzano, student gains are higher when students track their progress. At interims and end-of-quarter time, students fill out a progress report. They take the most recent score for each standard and record it under the corresponding level. This makes it easier for the student to determine their grade for the interim or quarter. Folders and progress report sheets are sent home to parents. I then meet with students individually to discuss their grade, making sure my Google Docs gradebook reconciles with their progress report sheet. This system works really well for me. While there are more scores to enter for each assessment, it takes the same amount of time as it would to tally up all the points earned if the quiz was scored traditionally. Be sure to read “Improving the Way We Grade Science” for more background on standards-based grading. (It’s where I picked up the tip to color-code the scores in the spreadsheet.) You can also check out my SBG bookmarks at http://bit.ly/SBGlinks. This entry was posted in Standards-Based Grading and tagged assessment, standards-based grading, technology. Bookmark the permalink. I’m wondering if there’s any way you could have google docs create a sheet that pulls out a single student’s progress, maybe with a pull down menu for the students. I’m sure I could do it in excel but I’m not sure about google docs. Of course if you had that the students wouldn’t technically tracking their own progress so probably what you have works better since they take an active role in the charting. 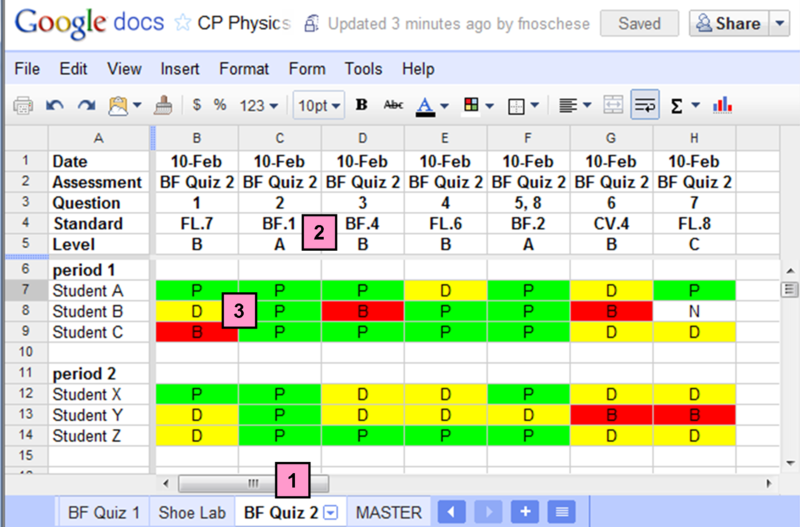 What I’m building onto my own online grade book is a way to chart a student’s progress using the google charts api. My hope is to have a plot of assessment score vs date where if you hover over a dot you’ll see any comments I’ve put in besides just the numeric score. Thanks Frank! This is where I’m having the most difficulty coming up with a system I really like… finding a way to efficiently score assessments on multiple standards for >100 students in an organized fashion that also allows for re-assessments and on-the-fly grade reporting (we’re required to keep gradebooks up to date, as parents have online access to student grades). I’ve actually been toying with the thought of OMR (optical mark recognition) software that will automatically bar code scan a student’s quiz or exam sheet and output multiple scores based on the individual standards. The setup would take a bit longer, but it might help avoid the “teacher is the bottleneck in the system” problem. The issue — OMR software is expensive!!! Again, thanks so much for sharing–after lying awake last night thinking through how to make the system work, and not coming to any great conclusions yet, you’ve given me a lot more to mull over. I was in exactly the same position (only I used Excel) last year when I decided to make ActiveGrade – if you haven’t checked it out in a while you might give it another look. You can enter grades for multiple students across multiple standards at a time, and those grades will be linked together just like you achieve with the multiple pages of your spreadsheet, but with the added convenience that you don’t need to copy/paste them to a master sheet to be compiled. Better yet, you can click on a student x standard cell on the master sheet and see a summary of the student’s progress in that standard, including any comments you left, with links to each assessment automatically generated and held consistent. The feature I’m really interested in adding to ActiveGrade is student input. I’m a big believer in student responsibility, and I’m worried that ActiveGrade almost makes it TOO easy for students to see and understand their progress – right now your system really shines in the way it keeps students involved. We’re working on a way to let students enter scores from their own self-assessments, which I’m really excited about. Sorry to wax on about ActiveGrade, but it really does behave almost precisely like your google docs solution. It just keeps data a little more consistent and reduces some of the hassle of copying/pasting, reporting to students, etc. Thanks for the post – over the last few months I’ve been really inspired and directed by some of your writing, Frank! I was going to end the post with a plug for ActiveGrade, and I totally forgot. You’ve got a great thing going, Riley, and I’m looking forward to more. But I also know teachers who wouldn’t be able to navigate an online gradebook and/or wouldn’t trust putting their grades in the cloud. It would be a shame for these teachers to write-off SBG for those reasons. Part of the reason for my post was to show those teachers there is a way do it in Excel. And Adam’s got a great system, too. Thanks! 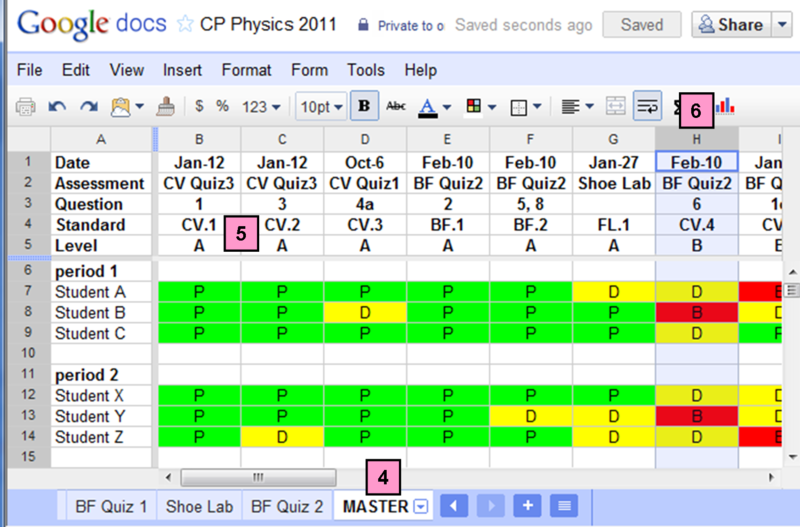 I’ve been wrestling with the same issue — automated gradebook vs. students tracking their own progress. My solution so far has been to post their quiz grades online… but not in a timely way. When the students realize I can’t be counted on to do this as fast as they want, they start keeping track themselves. What do your assessments look like so that the scores are easy to record? Bryan, I’ve got a few examples up at my post SBG Free & Clear. I like the spreadsheet approach a lot. One big advantage ActiveGrade has, however, is that a student can see his or her grades on the web. Do I understand that in your GoogleDocs system *only you* can see the complete, detailed data for a given student? I’ll be switching to Active Grade this year. (Also tinkering with Cornally’s Blue Harvest.) But, yes, in the GDocs system, I can only see the up-to-date information about each student, not the progression. That is why I had each student hand record their grades into the folders. Trying to wrap my head around a million different aspects of SBG…I was wondering if you know of anyone who uses Powergrade gradebook from pearson to do the SBG reporting? Teachers that are forced to use school gradebook have some workarounds. One is keep 2 gradebooks: the SBG one (ActiveGrade, BlueHarvest, Excel, etc) and the school one. Records grades in SBG gradebook like you normally word. Then, for the school gradebook, make each assignment represent a standard (rather than test 1, quiz 2, etc.) and periodically update the scores for each standard as students reassess. The score history for each standard is lost, but you have that data in the SBG gradebook (and hopefully in the kids folders, too). Few questions about the grading scale you have. -If a student is proficient in the Advanced concepts but is still struggling with some of the Core concepts, which I know is most likely rare, how does the percentage at the end add up? -How do you grade the students other assignments that might not fall into the category of SBG (if there is such occasion). For example, lateness, work ethic, projects . . . ? -If a student is assessed on a specific concept early in the quarter and preforms at a proficient level and then later in the quarter is assessed again, preforming at a beginning level, how do you assess their learning? Thanks so much for all of your documentation, it has been a great help! I appreciate your time! (1) It’s a conjunctive scale, so the Advanced concepts are irrelevant unless the core is met. Using the scale given in the post, the grade would be below 70. (2) Reported in a separate comment section. Doesn’t factor into numerical grade. (3) The most recent learning is what counts. An exception would be if the student had a long streak of proficients and made an uncharacteristic flounder late in the year. I think the preponderance of evidence still suggests he’s mastered it. Even the pros have their bad days, right? In my context all learning objectives have equal weight. What are some possible pitfalls in the case that each learning objective is given equal weight and marked out of 5 (for instance), and a grade is simply the culmination of marks? One problem I see with this is that on their own, some learning objective questions could realistically be marked out of maybe 2 or 3 (ex calculate average velocity) whereas other learning objectives could be marked out of 5 or 6 (projectile motion). I suppose a spreadsheet could normalize everything to the same number. I recall reading some other postings on sbar (perhaps not your site) where teachers were sharing all sorts of ways and methods for arriving at a grade from their sbar data. If I remember correctly, some people were applying algorithms and fit curves to their data into a mark/grade. I’m not sure I understand the basic reasons behind why we can’t assess (and remediate) according to standards but still consolidate the marks. When I first did SBG, all standards had equal weight. This became a problem because I tended to have more “easy” standards and fewer “hard” standards. So in the end, there were students who really struggled with the big ideas of physics that were earning As. One solution to this problem is to use a conjuctive grading system. Other people like to score the “bigger” standards out of more points. I have been reading a lot of what you’ve written about physics teaching on this blog and other places and I want to thank you, on behalf of the future students in my community, for helping me make a decision. After 19 years of what I, my students, their parents, my administrators and a few organizations that give out teaching awards, have thought was successful teaching, you have convinced me that I am not smart enough to teach physics. I will be resigning at the end of this school year to go back into industry, before I screw up any more kids. A question Frank – do you allow your students to keep all their quizzes? I know they would be good study materials, but then if you offer another student the same quiz, there’s a chance they’ve studied off someone else’s quizzes…and then is it a valid assessment? Yes, my students are allowed to keep their quizzes. So if two students reassess at different times, they get different quizzes. It sounds like a lot of work, but what usually happens is a bunch of kids come at the same time to reassess on some standards, usually right after an in-class quiz, so I can make just one quiz since they all take it simultaneously after school. Another really good way to reduce your work load is make sure that commonly missed standards show up on the next in-class quiz. I’ve found that most kids are successful the second time around. Hi Frank, I have initiated SBG this year in my AP/Honors and College Prep Physics classes and have found your site a goldmine of information and insights. Thanks. I am using Jupiter Grades (formerly SNAP Grades) as that is the school program. It does not support SBG very well but this semester I have developed a work around. I just keep track of the standards performance in the program. Students and parents can easily see where they stand on each one. Last semester I modeled my scoring rubric after yours, with A, B and C level standards. I had some students who did well on most standards but let one or two slide and it clobbered their grade. This semester I ‘m making all standards have the same weight. Bonus: the book keeping is easier. I have also modified the scoring rubric. Assigned work (labs, problem sets, webquests) can only score up to a 3. My rationale is that this is work on which they had access to help (teacher, book, tutor, friend). A score of 4 on a standard can only be made on a test or quiz where the student is on their own. The unit test counts towards 20% of the grade and it can raise the standards grade to a 4. This has provided an incentive to study for the test. Standards can always be reassessed but only to a 3 level. So far this seems to be working. One problem I had with all standards being the same weight was when I had more A-level than B- and C-level standards. I had students who were really struggled with conservation of momentum and energy, yet were getting 90+ because I had more “easy” standards than “hard” standards. On the other hand, conjuctive grading can be a nightmare when a kid who’s mastered everything except for one A-level standard ends up with a 68. Ideally, as a teacher you would be constantly reminding students with unmastered A-level standards to come and reassess. Or you would make sure that on every subsequent in-class quiz, those kids got questions about their unmastered A-level standards. One option I thought of would be to just assign different point values for A,B,C-level standards so that if a kid mastered only A-level standards the grade would be 70 (ie, 20 points above a 50), and all B-level standards the grade would be 90 (ie. 20 points above 70). And C gets to 100. Then just add up the points and remove the conjunctive barriers. For example: Suppose Sally had mastered 9 of 10 A-level standards, 7 of 8 B-level standards, and 0 of 2 C-level standards. Under the “all standards are equal” system, Sally’s grade is 90 (50 + 16/20*50) Under the original conjuctive system, Sally would have a 68 (ie, 50 + 9/10*20) because she didn’t master all the A-level standards. Under the weighted system, Sally would have an 85.5 (50 + 9/10*20 + 7/8*20), which I think is a more accurate reflection of what she knows and can do. I hope that all makes sense. I worry that the more convoluted systems become, the more kids focus on the system and less on the learning. I think it’s better to keep it simple than to add complex rules. If a student misses only a single standard and ends up with a 68, hopefully at least he/she has had a lot of warning that he/she’s headed in that direction. If you don’t really think that mastering 19/20 standards is worth a 68, of course, you should have a different grading policy – but I think it would be better to say “15/20 earns an 80” instead of “calculate these points from these standards and then add them all up.” The former keeps the focus on what you know, and the latter focuses on points. I’m super-excited about all of this SBG stuff… And I know I’m a little late in the game here on this particular post, but does anyone work at a school with a “traditional” grade reporting system? The powers-that-be in my district are raising eyebrows at my proposal to overhaul my system, and at my attempts to adapt this new style to the existing infrastructure. They like the idea of students improving, using standards, etc, but they’re concerned about what my gradebook would look like using THEIR system (which I have to use, ultimately). They’re afraid that someone looking in on a student’s grade would have no idea what they’re seeing. Does anyone have any suggestions as to how to make this work so there is transparency in the system for parents, students & school officials to understand what they’re seeing when they look at a student’s grade online? HELP! I’m desperate! I am wondering if there are any primary grade teachers currently using ActiveGrade. Very few seem to post grade levels here. I teach 2nd grade and we were supposed to move to a standards based report card last year. That didn’t happen, but I want to be ready for when it does.